In Britain recently, eyebrows were raised when a Japanese rail operator Tsukuba Express issued an apology for the 9.44 Tokyo train leaving 20 seconds ahead of schedule. British commuters conditioned to delays and cancellations on what is perceived to be the UK’s creaking and unreliable transport infrastructure could be forgiven for marvelling at a huge cultural difference in expectations between Britain and Japan- and of course the news story became instantly popular on UK social media. 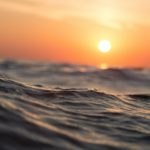 Transport problems on a small island with a huge proportion of the population commuting in to major UK cities is seen as a major theme of British working life and a cultural meme (another one is a national obsession with the weather). In fact, cultural assumptions affect a huge range of behaviour. 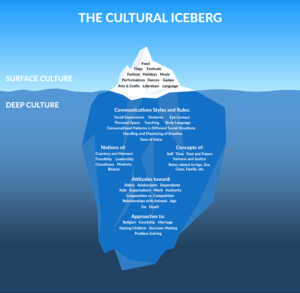 Cultural models often depict an iceberg with easy to recognise cultural indicators like language being above the surface- but with the majority of cultural traits being hidden below the surface. Given that these cultural markers help define a society, what effect do they have on web design and web behaviour? 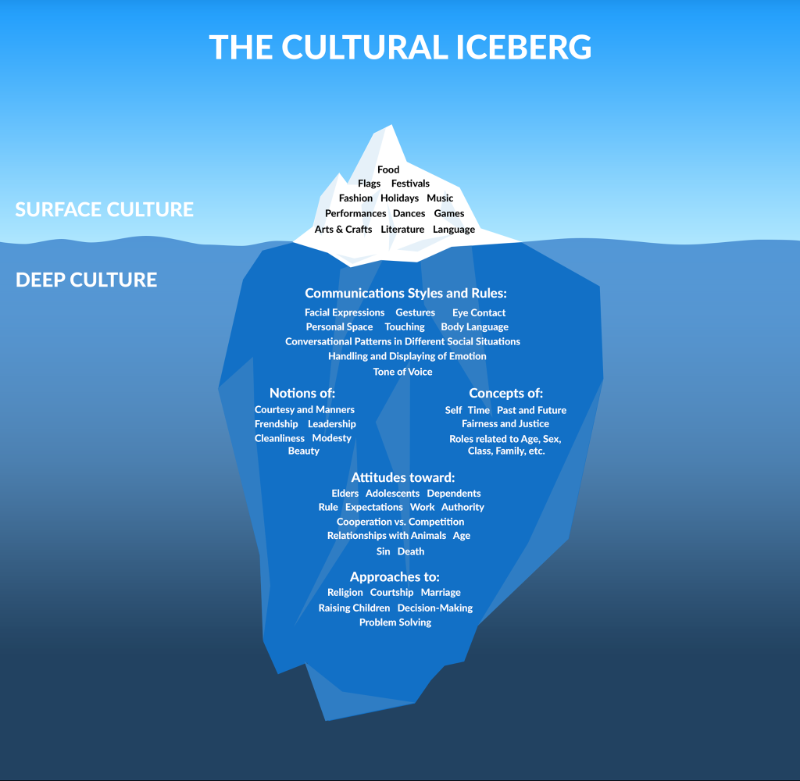 Does culture matter? To answer this we need to consider two strands to digital globalisation. In one strand, an interconnected world has freed up consumers to connect with and make purchases from businesses all over the world. In the other strand, the rate of societal and technological change has contributed to a sizeable backlash against globalisation with a portion of voters in elections voting in large numbers for popular politicians with a noticeably nationalist and protectionist outlook. So what is going on? Are global consumer’s perspectives widening or narrowing? Power Distance- the propensity of individuals in a society to accept that power is distributed unequally. European-style democracies for example traditionally have very low power distance. Individualism Vs Collectivism- whether a society is organised to reward and celebrate individual achievement or collective endeavour. Masculinity Vs Feminity- in this sense this means societies preference for assertiveness and material reward in contrast to co-operation and modesty, or as it is sometimes described in a business sense “tough vs tender”. Uncertainty Avoidance- the degree to which societies tolerate ambiguity and uncertainty. Countries with high UI tend to be more rigid and dogmatic, weak UI countries are more relaxed and open. Long Term Orientation (LTO) Vs Short Term Orientation (STO)- preservation of traditions and norms exhibit high LTO versus a more pragmatic and thrifty approach is indicative of STO. Indulgence Vs Restraint- social freedom versus regulation of social behaviour. The Hofstede model allows researchers to undertake comparative analysis between countries. 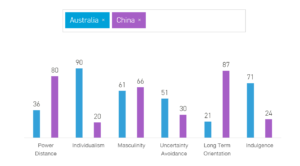 In the comparison table when looking at Australia and China, the two countries are quite different in Power Difference, Individualism, Long Term Orientation and Indulgence. The Cultural Dimensions model has been applied to web design and web behaviour, most notably in a paper by Marcus and Gould, where the indices are used for proxies of design elements or interface preferences. For example, in countries with a high level of individualism and masculinity you might expect users to prefer to assert themselves by using on page search features and taking control of the interface. With sites with a high score of Power Distance you might expect users to defer to the expertise of the designer and follow hierarchical navigation queues or orient themselves via breadcrumbs. Marcus and Gould looked at 12 sites across the 6 dimensions and made the following observations. Power Distance Malaysia (higher PD). University Site. Focus on the institution. 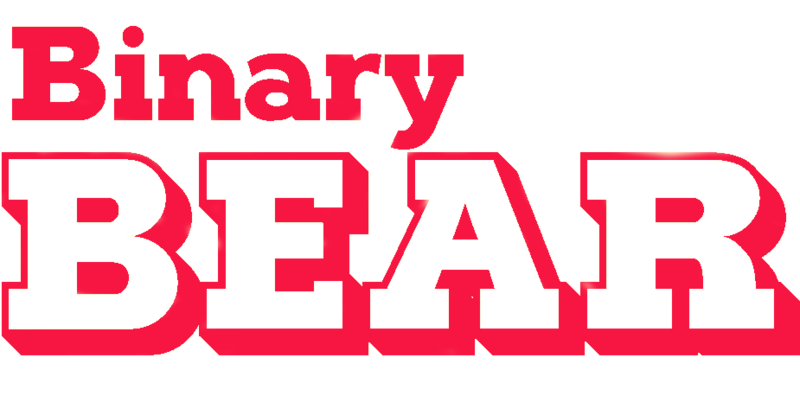 Official seal of the university. Photos of faculty leaders. Netherlands (lower PD). University Site. Focus on students of both genders. Photos of students. Student tour. Individualism Vs Collectivism USA (higher individualism). National Park site. Focus on visitor’s goals and objectives for visit Costa Rica (higher collectivism). National Park site. Focus on nature and national conservation policy. Masculinity Vs Feminity Japanese Search Engine (higher masculinity). Focus on gender topics, separation of sexes. Busier more detailed design. Swedish Search Engine (higher feminity). More gender neutral, calmer design with more white space. Uncertainty Avoidance Belgian Airline (higher uncertainty avoidance). Simple imagery, clear choices. UK Airline (lower uncertainty avoidance). Complex design, multiple pop ups and drop downs. The Marcus and Gould paper therefore does find some elements of consistency with the Hofstede model- but the fieldwork was some time ago and the digital landscape has evolved. Is it still applicable? 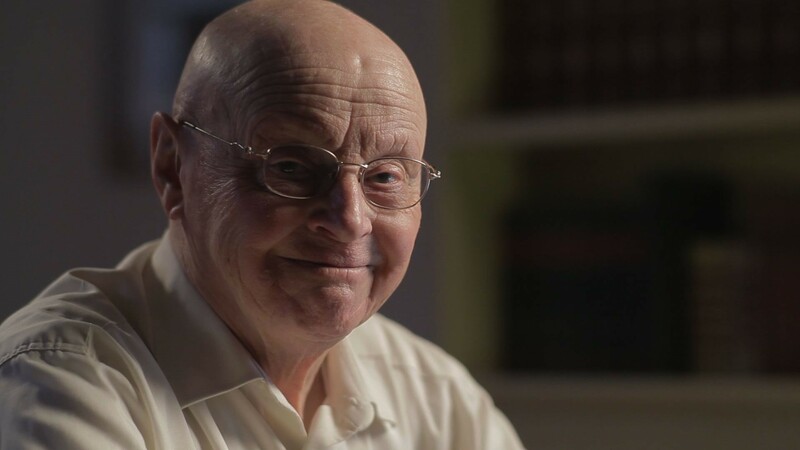 There is one other source of evidence that suggests the Hofstede cultural model is still in play and that is in cultural choice of tech platforms. In Anglophone countries there is market dominance of Google for search, Amazon for shopping and Facebook, generally these countries have higher levels of Individuality, lower levels of Masculinity, Short Term Orientation and low levels of Power Distance. In Russia, Yandex dominates search, VKontakte social and Ozon the online shopping market- all local Russian brands in a society with a high level of collectivism and masculinity. In China, searchers use Baidu for search queries and Alibaba is the dominant shopping platform. Arguably even more important is WeChat which dominates social, messaging, b2b comms and shopping and has over 950 million users. WeChat has been involved in many controversies in the last couple of years related to censoring of messages and the sharing of data with the Chinese Government. It could be argued that the centralisation of web activity in China within one platform that does everything (WeChat) and the yielding to autocratic levels of control are evidence of higher levels of Power Distance, lower levels of Individualism and higher levels of Long Term Orientation consistent with Hofstede’s model. 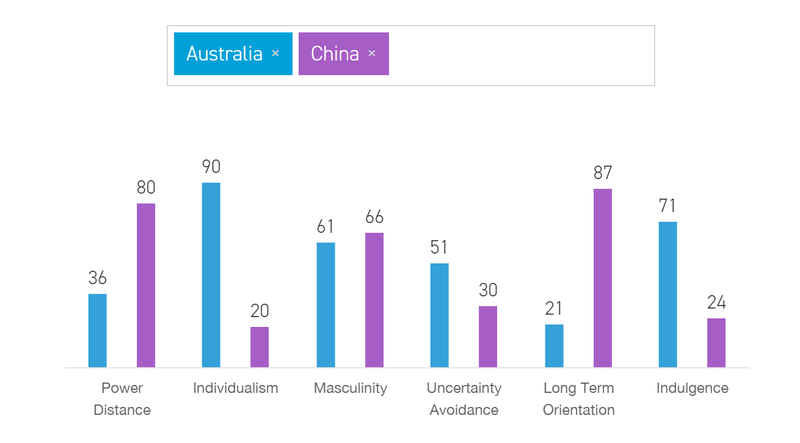 Cultural models such as these can only ever by general markers- clearly there will be individuals in each country that exhibit the opposite behaviour to the cultural norm, and Hofstede himself stated the model is only intended to be relativistic. However, these models have some use: consumers are responsive to global brands, have embraced the societal shift enable by the internet, but still prefer to shop, search and share from local platforms. So if your business aspires to sell goods or services globally, you should consider the cultural requirements of each market you are selling into and adjust your web design and advertising approach accordingly.